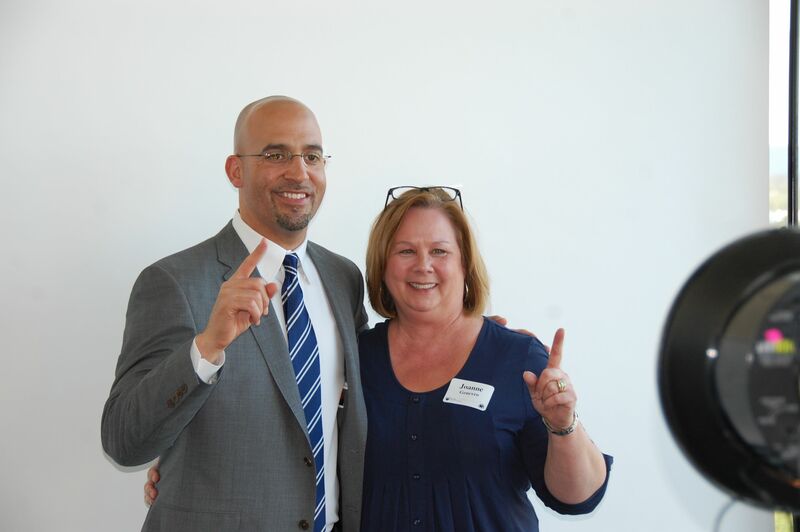 One of the hundreds of fans who got to meet James Franklin on Thursday night. It felt a lot like the past two years: Loyal Penn State fans turning out for an offseason football fix and a chance to meet the new coach. It also felt very different. Different venue. Different coach. The start, once again, of a different era. 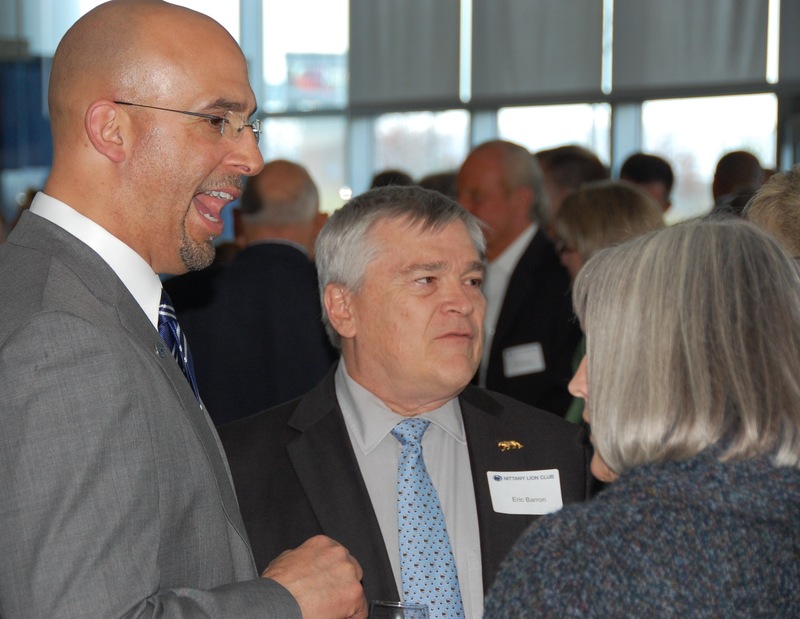 James Franklin took center stage Thursday night at Pegula Arena, where the third Penn State Coaches Caravan kicked off within sight of Beaver Stadium. More than 400 fans turned out, and it appeared all who wanted to had the chance to take a quick picture with Franklin at the photo station on the upper concourse. Other coaches—Patrick Chambers, Bob Warming, Russ Rose, and a few members of Franklin’s new staff—mingled with the crowd over appetizers, before fans settled into their seats to see Franklin, Rose, and Warming speak from a chilly stage on the ice. * The new coach and new president had what we believe was their first meeting Thursday at the pre-event reception. Eric Barron and his wife, Molly, popped in briefly and spent some time talking with Franklin (below), then made their way out—mostly unnoticed—before the coaches took the stage. Barron, the subject of the cover story in our May/June issue, officially takes over as Penn State president on May 12. * As you’ve no doubt noticed, in nearly every posed photo since he arrived on campus (including the one at the top of this post), Franklin is holding up his index finger in a “No. 1” pose. Hoping to ask him how and why that became the thing he does when the Caravan hits the road next week. * Roger Williams ’73, ’75g, ’88g, our executive director, presented Franklin with a life membership Thursday night—meaning he’ll now be getting The Penn Stater at home. We expect an occasional letter, Coach. The Caravan hits the road for real next Tuesday, and I’m excited to be back on the bus for a third year. I plan to have a bunch of updates over the next two weeks, both here and at The Football Letter Blog. If the past two years are any indication, I should come out of it with some great stories. Hope to see you on the road. Entry filed under: Alumni Association. Tags: Bob Warming, Coaches Caravan, Pegula Arena, Roger Williams, Russ Rose.